As far as PCI passthrough, I was able to get a Geforce card working with IBM SLOF on the p-series machines in Qemu. However Openbios lacks some of the .words needed, I've been hoping someone with more programing knowledge would help in implementing the needed @config .words for Openbios. 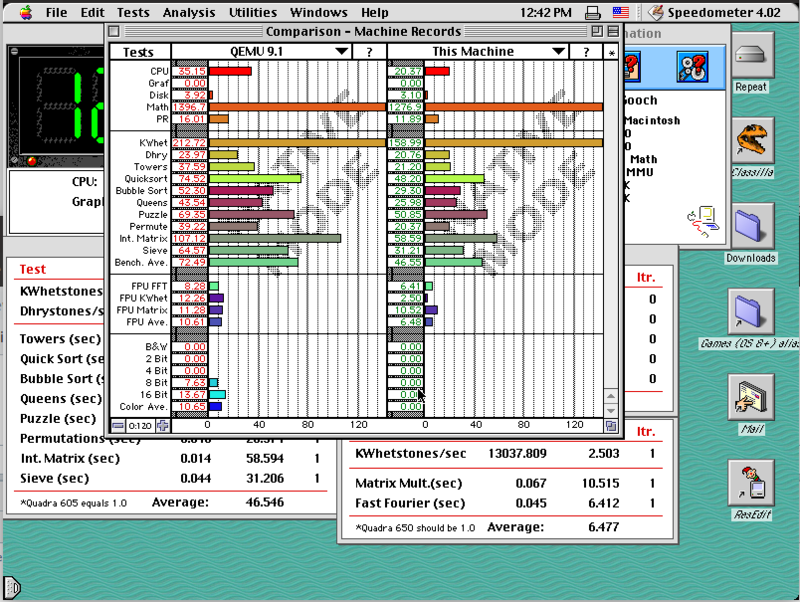 I did test a PCI Firewire card, in a PCI-E to PCI adapter and that worked great in both OS 9 and OS X in Qemu. Tho my host system refused to boot with a PCI Radeon 9200, so I was unable to test that with Qemu. Until we add the needed .words to Openbios, the only video option other than Qemu-VGA would be a Voodoo2 PCI 3D card. I'm still trying to find one at a reasonable price for testing, unfortunately the price on them keeps going up. If anyone has one they'd like to donate, or sell cheaply, that would help the cause. I created new sound enabled (screamer) builds for OSX and Windows. -The windows build performs slightly less well compared to the OSX build. -You need the most recent Quicktime and iTunes installed in the various guests for best performance. -10.4 and 10.5 guests can play internet radio with some crackling (like playing an old scratched record). -Starting the sound control panel in OSX guests when already playing music creates havoc in the audio stream. -Moving the whole window in which the guest runs disrupts the stream in Windows host, but not in OSX host. -9.x are still the best for audio playback. -I experimented with various variables available for controlling the audio, but haven't found a perfect mix. Do you happen to have a link to the source that was used to create the binaries? Has any attempt been made to build them on 64-bit Linux? Just to clarify, the screamer builds do have a hard requirement on iTunes and QuickTime for audio support? I build on Linux regularly, but the sound performance is no better there. iTunes and QuickTime are not strictly required. Not sure what I'm doing wrong. I've got iTunes 2.0.4 and Quicktime 6.0.3 installed under 9.2.2. Audio is glitchy at best and most of the time is nonexistent completely This has been the result for every screamer build. This is my one tiny problem with Qemu. Everything else is awesome. Never thought I'd be running 9.2.2 like this. If I can figure out the audio problem, it'd be almost perfect. I'm having an intersting issue: with the new build, -rtc base="2000-12-25",clock="vm" is being ignored, which is a problem for the OS X Public Beta. -rtc base="2000-12-25",clock="rt" returns the same result -- "OSXPB has expired". Anyone know what might be going wrong? This works fine in all other builds of qemu I've tried. You can ignore my previous post -- the issue is that sungem is working correctly with the PB now, and so NTP is updating the time after I've set it but before the OS checks it :} Turning off the network connection fixes that, and everything's happy. I am using Mac OS 9.2.2 with the USB audio device. Audio (when it does work) plays perfectly for about 30 seconds. Then it stops playing. I'm not sure what changed but this is definitely a huge improvement for the USB audio device playback. I have Quicktime 5.0.2, iTunes 2.0.4, and QEMU 3.0.91 (v3.1.0-rc1-dirty). What happens when you use your default sound device on the host? I used the USB audio device that comes with QEMU. I have experiemented with using a real USB sound card in QEMU. The results were not good. Do you have any tips for improving Linux performance? I made a build from that source on Ubuntu 18.10 and the speed is pretty atrocious compared to the OS X pre-built binary, on the same machine. Are you talking about the screamer builds in both cases? And when doing what? I regularly test their speeds in 9.2 with MacBench. OSX and Linux builds have more or less the same speed. Only the Windows builds lag by some 10%. It should be Screamer for both, since that's the main build I use and care much about. The general performance is visually more sluggish with the motion on the screen being more choppy than I recall in OS X. Also, there's some benchmarks with Speedometer below. 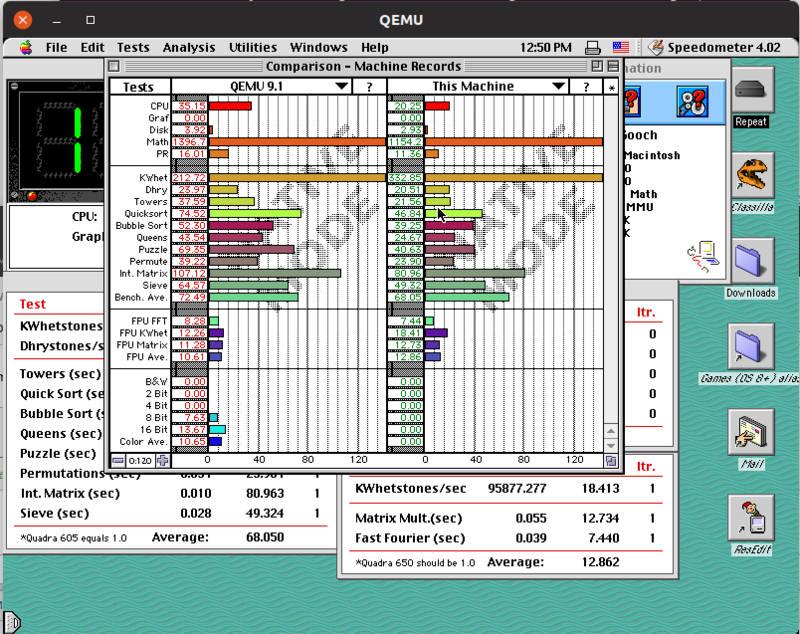 "Qemu 9.1" is the tested performance of the machine in OS X; the others are with my Linux build, set to emulate G4 and G3 processors respectively, in the start command. It's my experience that there's naturally some variation in whetstone results, so that doesn't bother me much, but the lag elsewhere is concerning. One with some altivec acceleration (noticeable in slightly improved display speed). One with the same improvements, but also supporting the screamer audio device. So the OS X hardware has to be 2014 or later, as AVX2 was introduced with the Haswell architecture; Sandy Bridge (2011) and Ivy Bridge (2012) don't have it. That said, I don't think I'd want to attempt running OS X on QEMU-PPC on anything older than a 2014 Mac anyway; it'd be an awfully painful experience. PearPC would be a much better option there. Note that the OSX builds will only run on CPUs supporting the AVX2 extensions. Does the altivec acceleration require AVX2 on Windows? I erroneously assumed the Altivec acceleration could only be achieved when compiling with support for AVX2 extensions. Mark pointed out to me that Qemu can decide when to use the acceleration at runtime. I fixed the OSX downloads, so they now also run on machines not supporting AVX2. No, the windows builds run fine without. adds basic emulation of these ATI VGA chips. Great news! Props to whosever submitted that; I know that basic gfx emulation isn't easy. Here are two images showing that the ati kext gets loaded in OSX Leopard and that the properties are shown in the device tree. The properties, however, were already available in Openbios. It seems the ati driver makes Openbios select these in the tree. The kext does something, as the mouse disappears and only reappears after moving the mouse to the dock. However, the actual payload from the rom is not loaded. Also, the kexts stem from Tiger (which has the kexts available by default). Not all kext/bundles can be used: Including the ATIRage128GA.bundle (Graphics Acceleration) leads to a completely distorted screen. Still your screenshots do look promising, Cat_7! Many kexts did not work well when moved from 10.4 to 10.5. Yes, for Tiger the same kext has to be removed. However, as this does not offload work to an actual GPU, speed improvement will not be likely.